I got home at 11:30 from band practice last week and made this simple meal for one, but it was actually great. At the gourmet grocery stores here, they sell “Spaetzle” – a german egg pasta, which I wonder if they sell it in Whole Foods because it is a pain to make homemade (our au paires used to make it when we were little) and this grocery store version is very good. Spaetle is the best. 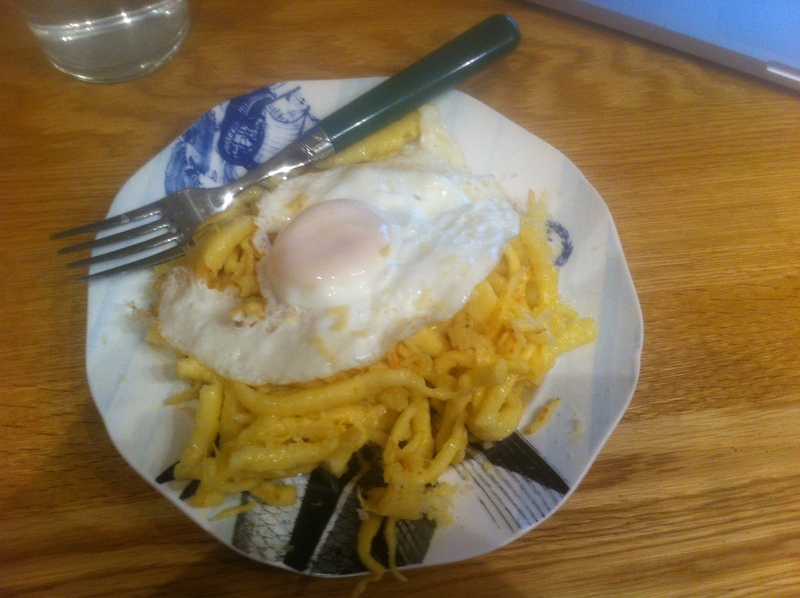 So i sauteed the spaetzle in 1/2 walnut oil , 1/2 butter (you can use anything), grated lots of emmenthal/swiss cheese on top (optional), and then added my new favorite perfectly fried egg. You need to make this perfectly fried egg. This dish would also be delicious without the added dairy (e.g. cheese), if you can find the Spaetzle, and it’s so so good and easy.